We’d love your help. Let us know what’s wrong with this preview of The Face at the Window by Regina Hanson. Dora learns to overcome her fears of a mentally ill woman who lives in her community in this gentle and compassionate story set in contemporary Jamaica, West Indies. To ask other readers questions about The Face at the Window, please sign up. The Face at the Window begins with Dora and two of her friends in their neighbor, Miss Nella’s, yard. They’re trying to hit mangos off a tree to eat. Dora accidentally throws too hard and hits Miss Nella’s door. Her friends all tell her that Miss Nella is a bad, powerful woman and that she will send her three-legged horse to kick her. Dora goes home, afraid, and tells her parents what happened. Dora’s parents explain to her that Miss Nella isn’t a bad, powerful woman, but that she has a sickness The Face at the Window begins with Dora and two of her friends in their neighbor, Miss Nella’s, yard. They’re trying to hit mangos off a tree to eat. Dora accidentally throws too hard and hits Miss Nella’s door. Her friends all tell her that Miss Nella is a bad, powerful woman and that she will send her three-legged horse to kick her. Dora goes home, afraid, and tells her parents what happened. Dora’s parents explain to her that Miss Nella isn’t a bad, powerful woman, but that she has a sickness in her head that makes her see and hear things that aren’t really there. They take her to Miss Nella’s house to apologize. Miss Nella answers the door, talks to them for a moment, then becomes afraid of thousands of crabs she hears. Dora reassures her that there are no crabs and offers her a tamarind she has in her pocket. As they leave, Dora asks her mother to help her make more tamarind balls for Miss Nella. The illustrations are lovely, colorful, and assist in telling the story. This story doesn’t have much depth or information about mental illness, but I like it anyways. I think it would be good to read for young children, whether or not they have experience with someone with mental illness. One of the main reasons I appreciate it is because it takes place in Jamaica (as the author is Jamaican) and uses dialectal speech. I think even though this book doesn’t go too deep into mental illness, it’s good to have books from other cultures about these illnesses. Mental illnesses are not exclusive to Caucasians, but many books on them are written through a white lens. 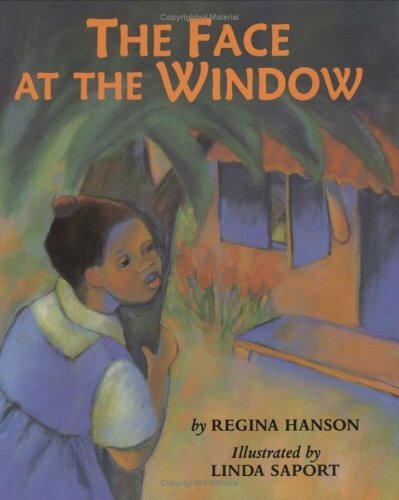 The Face at the Window was a story based out of Jamaica about a young girl who made a bad decision because she was trying to impress her friends. Dora took off a mango from a tree on Miss Nella’s house, who witnessed her taking it. Dora felt guilty and scared of what Miss Nella might do to her. There were many rumors about who Miss Nella was and what she was capable of. Dora told her parents of what happened, and they take her to go see Miss Nella. What will happen when they see each other again The Face at the Window was a story based out of Jamaica about a young girl who made a bad decision because she was trying to impress her friends. Dora took off a mango from a tree on Miss Nella’s house, who witnessed her taking it. Dora felt guilty and scared of what Miss Nella might do to her. There were many rumors about who Miss Nella was and what she was capable of. Dora told her parents of what happened, and they take her to go see Miss Nella. What will happen when they see each other again? The illustrations were done with pastels, with rough representations of the objects in the story. Most of the pictures, except a few, were two page spreads with black, simple text. The illustrations showed the main points of the text to give a reader a visual of what was occurring. Most of the pictures had darker tones to represent the young girl’s fears. The dedication of the author was interesting and touching. She dedicated the book to everyone with mental illness, which was fitting because of details given about Miss Nella. Overall this book was well-written with illustrations to represent the text. Plot: Dora, a young girl is terrified of getting bad luck after taking a mango from Miss Nella's tree and making eye-to-eye contact with her. The story of village and its oldest member, whom all the youngsters thought was completely insane. The youngest of all was also brave by explaining to her dad the insane rumors she had heard and it wasnt before she came to realize that rumors are just things people casually make up and its not always good to believe them. Great book to read to students when one may begin to talk about another, rumors they have heard, or telling stories on other people. Wonderful award-winning book. There are so many lessons to be had from this book: doing the right thing, taking responsibility for one's actions, compassion, facing your fears, and more. Beautiful, colorful illustrations. This book could be read to students to talk about why not to spread rumors or even telling stories on classmates.